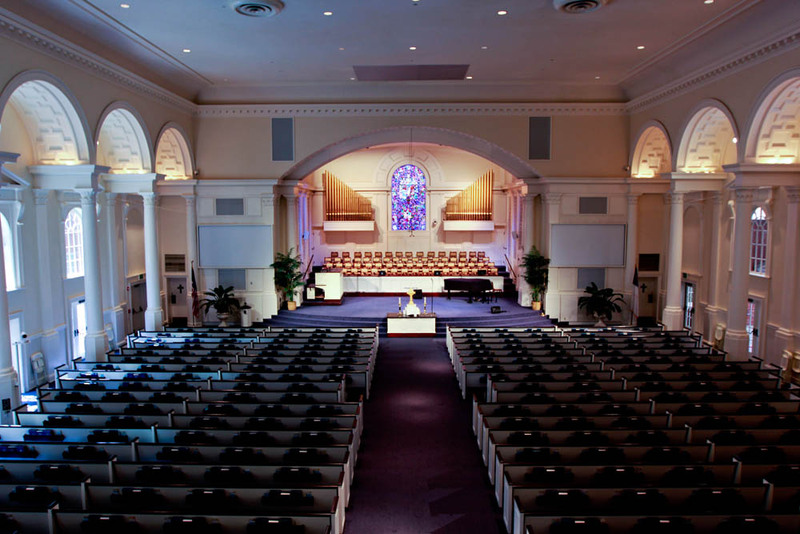 First on our list was the main sanctuary. 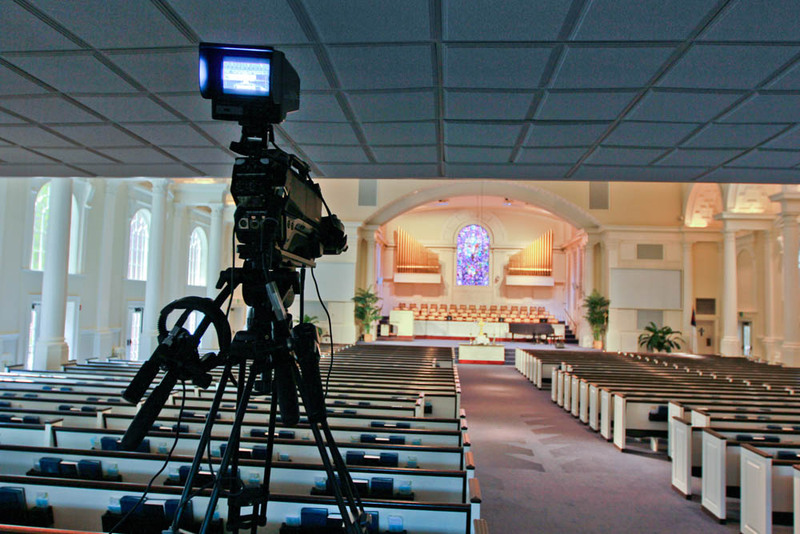 The camera system installation consists of four pan/tilt/zoom Panasonic AG-HE120W and two Hitachi Z5000 HD cameras with SMPTE fiber to specific locations. We had to be creative managing the run and dress all cables due to historical church interior décor preservation and seating capacity. For the projection we installed two 16K lumen Panasonic PT-DW16K projectors with long throw lenses to display an HD video signal on a custom wide screen. Fiber optics from the control room to the projection room was used to prevent signal loss and carry the video/graphics feed over 500 feet. 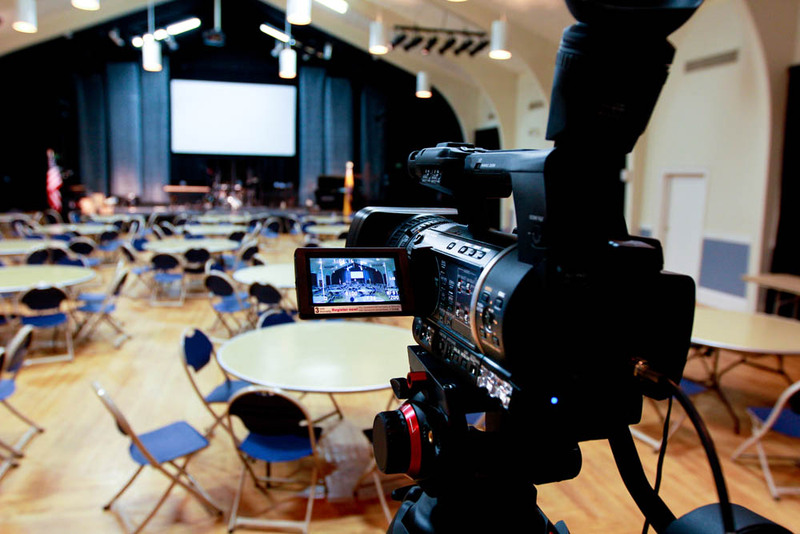 The projectors’ signal feed comes from an Analog Way PL200 scaler in which two HD-SDI and two computer graphics are switched. A high tech DVI distribution system is in between the projectors and the scaler. 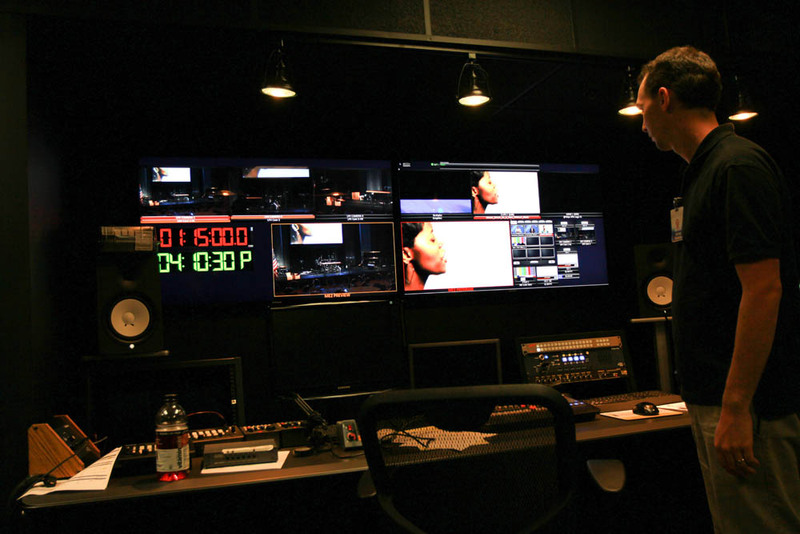 Secondly, we have the control room. 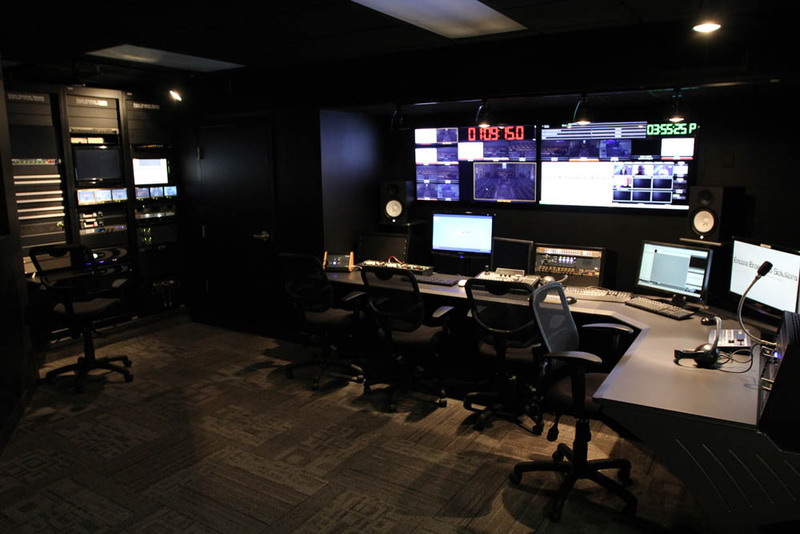 The relocation of the control room allowed the benefit of redesign and implementation of a new layout in order to allocate the furniture and racks in an ergonomically friendly environment for operation. The process took over six months with architects, engineers and electricians. 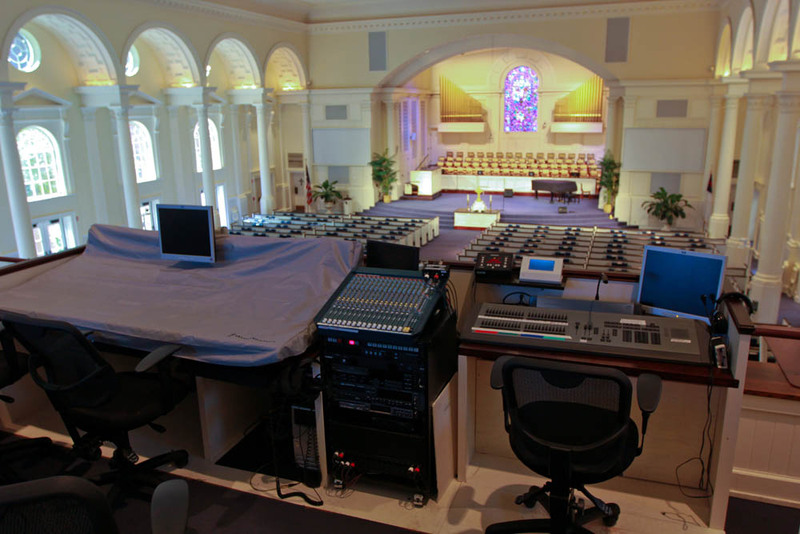 The control room was also designed to support the AV from the Lee Fellowship Room which conducts services back to back from the main sanctuary. 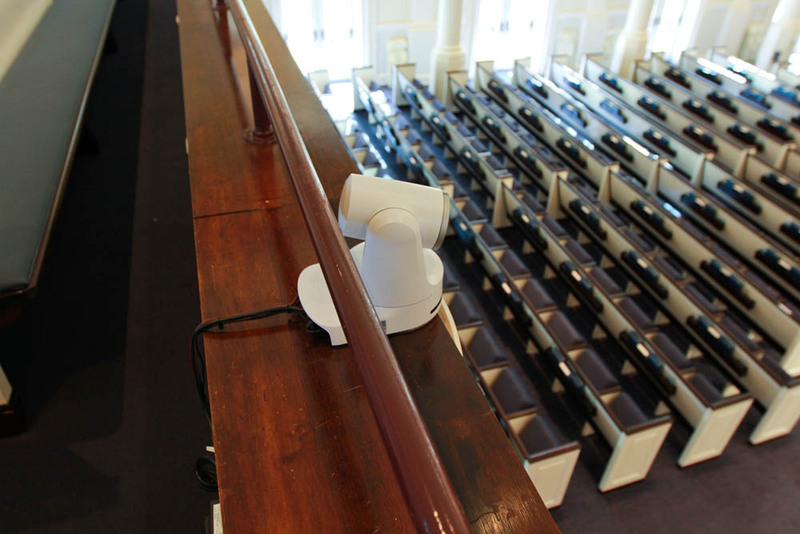 Also, an RF system was designed and installed to distribute the sanctuary signal through the school, administration offices and common areas. 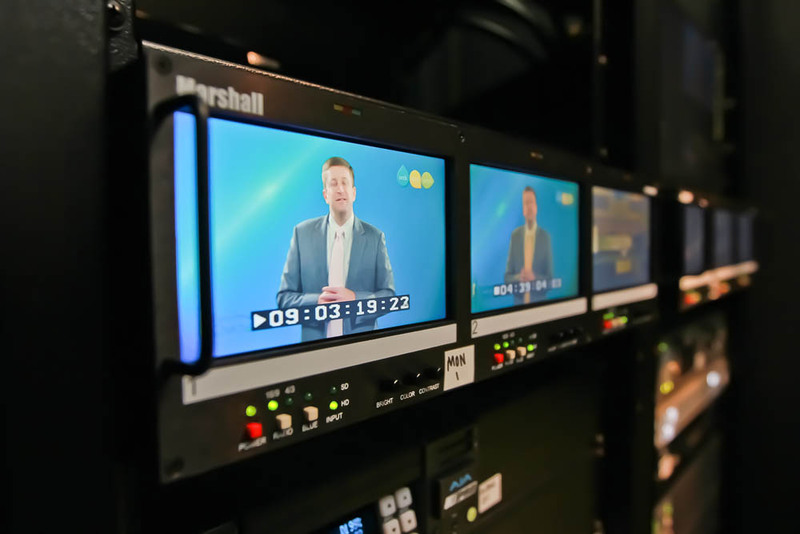 For production, a new HD system was designed and installed including a Broadcast Pix Granite 1000 video system and 16x16 Ross HD matrix router. 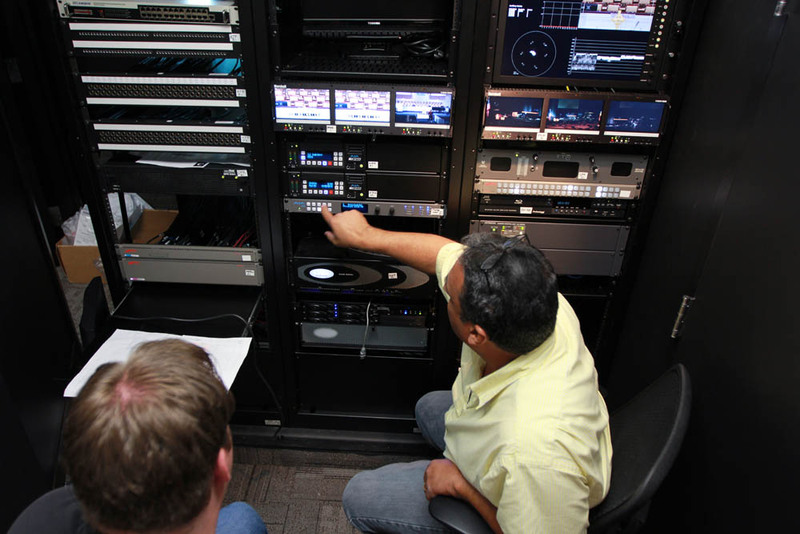 We also used two AJA Ki Pro hard disk recorders and Clear-Com MS-704 four channel intercom system. 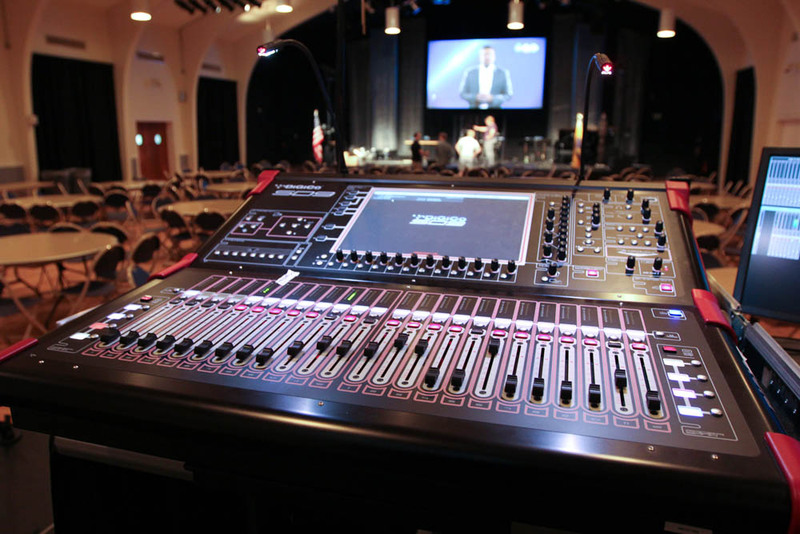 Other equipment involved an audio video patch bay system, Marshall scope and monitoring system, DiGiCo SD-11 digital audio mixer and an AJA FS2 frame synchronizer, all complimented with a custom Winsted Slim Line design console. Lastly, we worked on the Lee Fellowship Room. 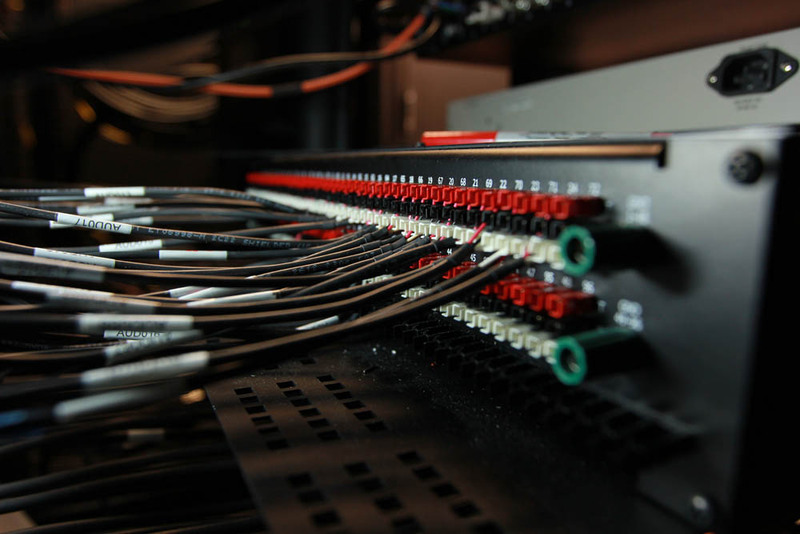 An infrastructure of coax, audio and fiber cables were installed to connect the control room with the tech booth. 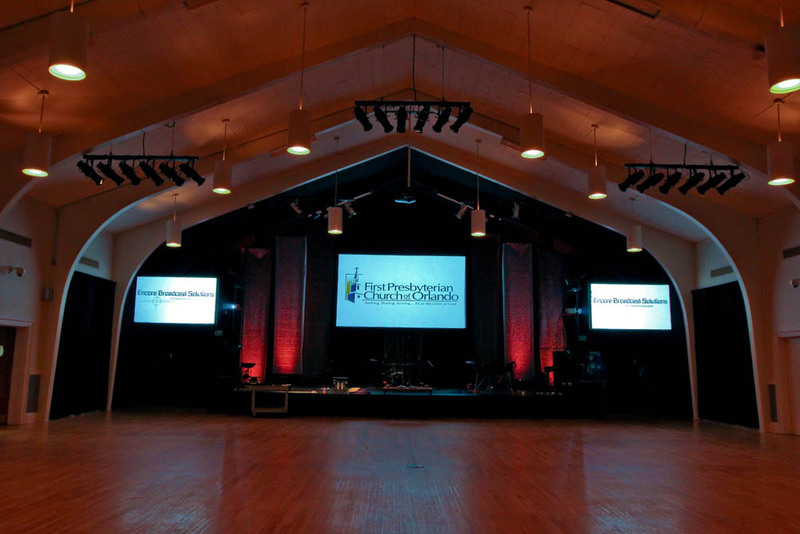 For projection we used two E-Vision 6000’s from Digital Projection that were installed to the side of the fellowship hall to deliver graphics and text content to the Da-Lite 7x4 screens. 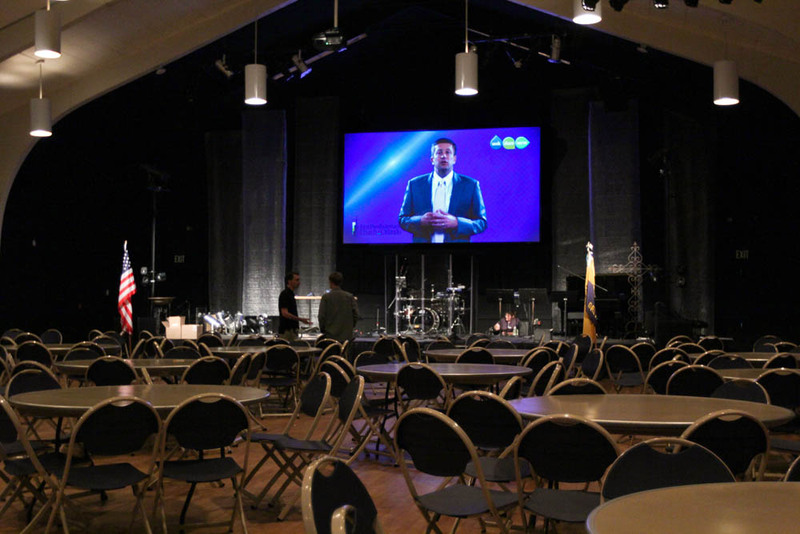 Digital Projection E-Vision 8000 projectors were installed at the center of the room to deliver HD video and graphic content to a Da-Lite 16x9 screen. 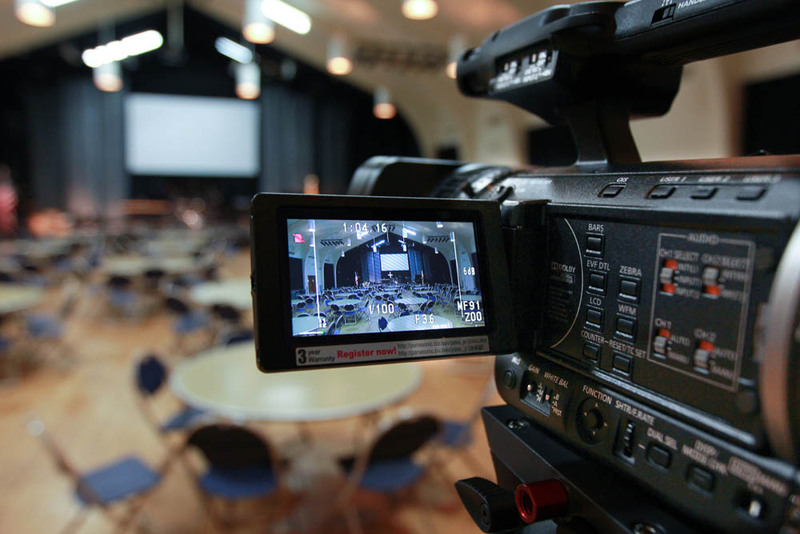 For production Encore designed and installed the new HD system using a DiGiCo SD-9 digital audio mixer, two Panasonic pan/tilt/zoom AG-HE120W HD cameras and a Panasonic AG-HE 160 camcorder. We used an Analog Way PL-200 scaler, monitoring system, AV distribution system and a Clear-Com MS-702 dual channel intercom system. For over a decade Encore has provided first class sales and service to our organization. As their name implies, they keep coming back. They help evaluate our needs before we order. While the order is processed they stay in close contact. When the order arrives they help us make sure everything is accounted for. During the installation they check up to see if everything is working properly. In short, they are with us every step of the way. I consider Encore much more than just a vendor. They are partners with us in every way. They care about the product we produce and the people who produce it. Recently, a friend from out of town came to see our control room. I walked them behind our racks filled with equipment to show off the cabling which was installed to perfection. I summed it up with one word... Encore. I wish everyone answered my phone calls and returned emails as quickly as Encore does. I used to think I was getting special service because I've known Encore for so long, but as I talk with others in the industry, I hear the same over and over. Encore cares. Most in our industry are not exposed to hands-on opportunities or to even see expensive equipment prior to purchasing it. 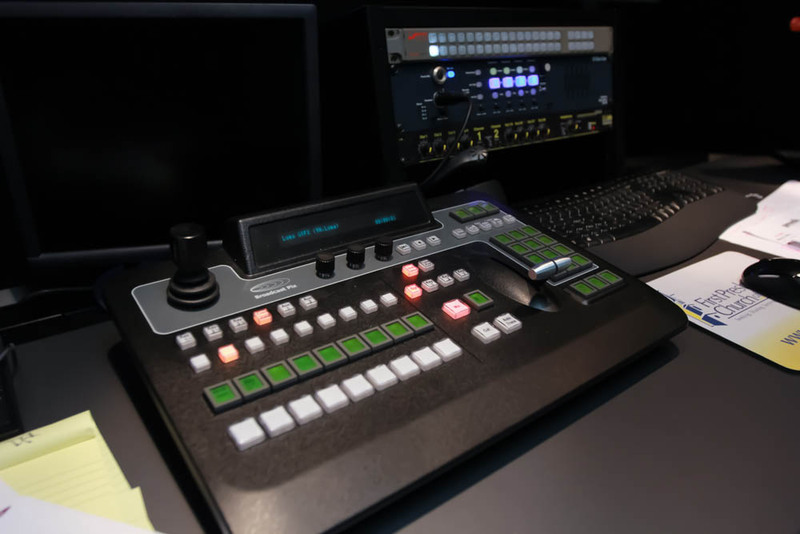 Encore not only meets us at conferences like NAB, but they host local exhibits from major manufacturers that offers us a close up look and training you don't receive from a box house. Our organization has a comfort level and trust with Encore that simply does not exist with other vendors. Thank you Encore for being there when we need you.